Funny story about this polish. Toxic Avenger is an amazing duochrome AND holo foil. The duochrome is similar to Orly Space Cadet or Hard Candy Beetle: it's a purple to gold/green duochrome in a teal base, but this has a ton of holo pigment added to it. Usually, the holo takes over in the sun, and the duochrome really comes out in indirect light. Basically, it's just all-around interesting! It's also not being made anymore, so I'd pretty much given up hope at ever finding a bottle. 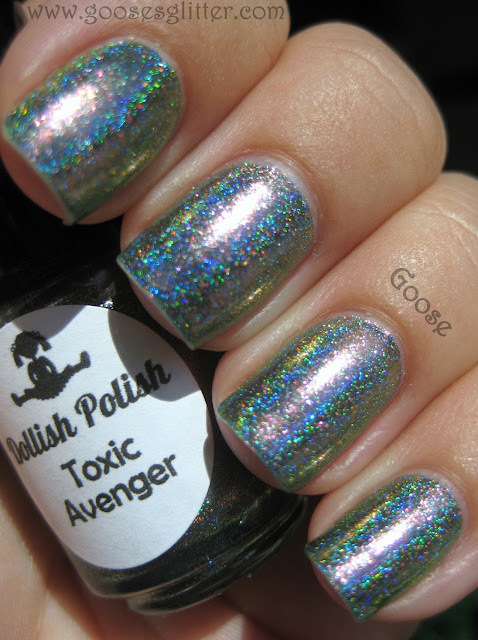 This was from a couple Dollish sales ago when the "bonus mystery shade" was a mini bottle of the original Toxic Avenger. I actually didn't know about the sale until it was already 15 minutes into it or something, and all the Toxic Avengers were in carts already (if you don't know, Big Cartel SUPPOSEDLY will hold it for 30 minutes once it's in someone's cart so it doesn't get taken from them while they're in the payment process). So I waited for another 15 minutes (wildly refreshing the page) until it was finally dropped from someone's cart into MINE... WOOHOO! I was so excited and hurriedly went to payment and just as I was about to pay on Paypal's site... BOOM, it's gone out of my cart (obviously, Big Cartel's hold does NOT always work). OH, MISERY! So I sat there for ANOTHER half hour wildly refreshing waiting for someone else to let go of one in their cart. And FINALLY, I got one and was able to pay for it, and you can bet I did it LICKETY SPLIT. I know the story sounds dramatic, but really, even if I hadn't have gotten it I would have just moved on with my day. I LIKE the chase of nail polish sales on Etsy/Big Cartel/whatever. I think it's fun to try and snag the polishes I'm longing for, but to me it will always still be just nail polish. At the end of the day, there are so many more important things to me. 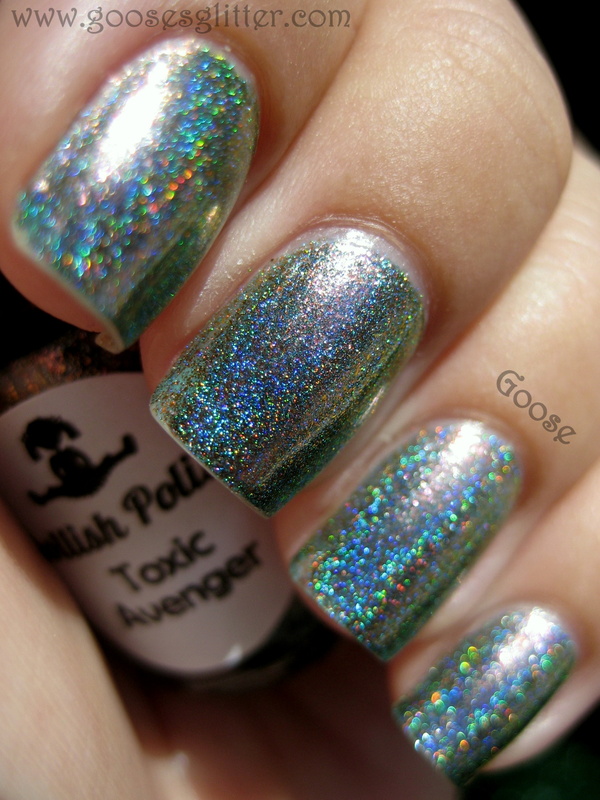 But yes, I DID spend an hour of my life refreshing a web page so I could get this polish, and it was totally worth it! Like I said, unfortunately (because of availability of ingredients) Dollish Polish isn't making this polish (at lease with this particular formula) anymore. It could be she releases it with a new formula in the future, so be on the lookout for it! Ooo that is just gorgeous, time to stalk swap boards and blogs sale for that one. Gahhh! I love this polish soo stinkin much! I was also devistated to not recieve it when it sold out :( Your swatch is perfection. So gorgeous! Looks like all that work was worth it! Gorgeous polish! Too bad it's kind of hard to get. OHMGoose what a dramatic story, I'm happy for you that you got it. It's truly gorgeous! Oh my! This looks stunning!! I just can not get over how stunning this is! I have a bottle of Toxic Avenger, and it really is an amazing polish, but for all the people that don't have it, putting a coat of HITS Hefesto over Orly Space Cadet will create a very similar effect. In my experience Hefesto sort of washes out the color underneath a bit, while Toxic Avenger seems very vibrant. I will definitely give it a try and post a comparison!